As Vermont attorney general, James Jeffords wrote the nation’s most stringent environmental protection laws and established Vermont as a no-billboards state. 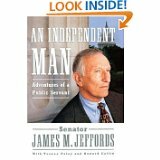 As Vermont’s lone Congressman and then Senator, he reached across the aisle to find compromise. Read the story of one of the nation’s last moderate Republicans and why he gave up the longest held Republican Senate seat to protest Bush cuts to education and other moves by his party.